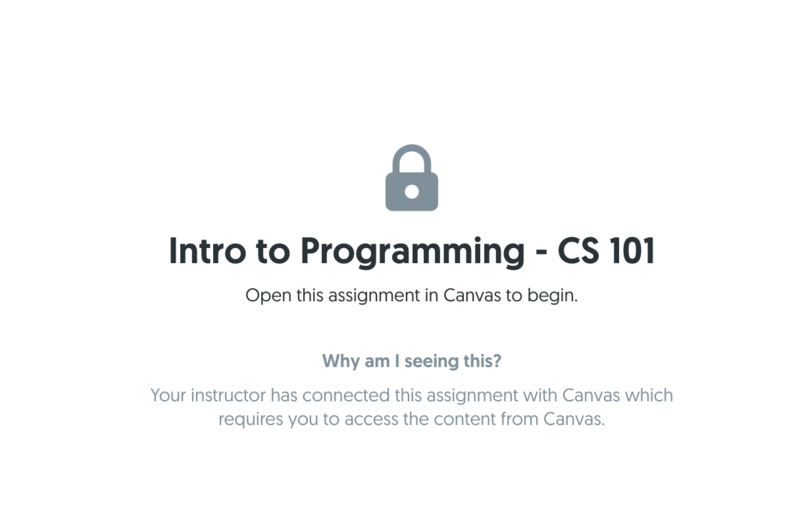 Course integration with Canvas. If you haven't completed the integration at a course-level, make sure you follow the steps in the link above. Start by creating the project or assignment in both Mimir Classroom and Canvas. It will ultimately be easier for your students to have matching naming conventions between both platforms, but they are not required to be the same. While creating and and editing your coursework in Mimir Classroom, you will be asked if you want the grades to be synchronized with your LMS. Note on start/due dates: Start dates and due dates will not synch across platforms. We recommend matching start dates in both Mimir Classroom and Canvas as start dates will cause a link to appear in Canvas. Due dates will mark the coursework as past due in Canvas but students will still be able to access the course through the link to continue working on it (i.e. late days, extensions, etc). Using the until date field in lieu of a due date will remove the coursework link in Canvas while keeping coursework available in Mimir Classroom. Save the assignment or project and access the corresponding assignment in Canvas or create it now. 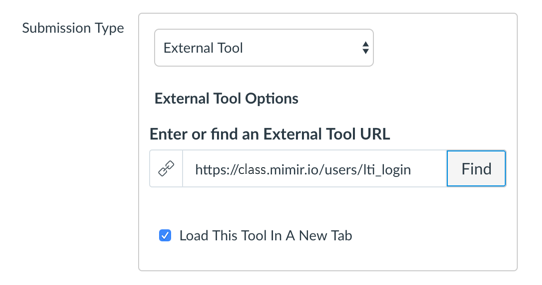 Under "Submission Type" select "External Tool" and click "Find" - choose the LTI connection you setup during the initial course integration; it would be called Mimir One-Click Login App if you followed the exact steps. Check to "Load This Tool In A New Tab". Save your assignment and click the "Load [project/assignment name] in a new window" button. Opening the assignment in Canvas will prompt them to "Load [coursework name] in a new window" and sync up is done. This will automatically create an account in Mimir Classroom if they don't already have one. When you're done grading, you can select students and release the grades. 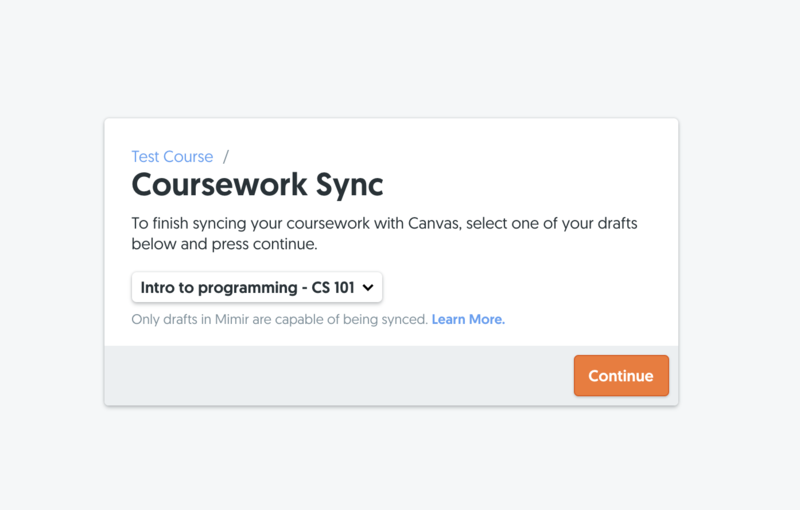 Once the grades are released, they will be automatically synced and updated to Canvas. The following warning will display on the release & sync grades modal if your students have missed this step. 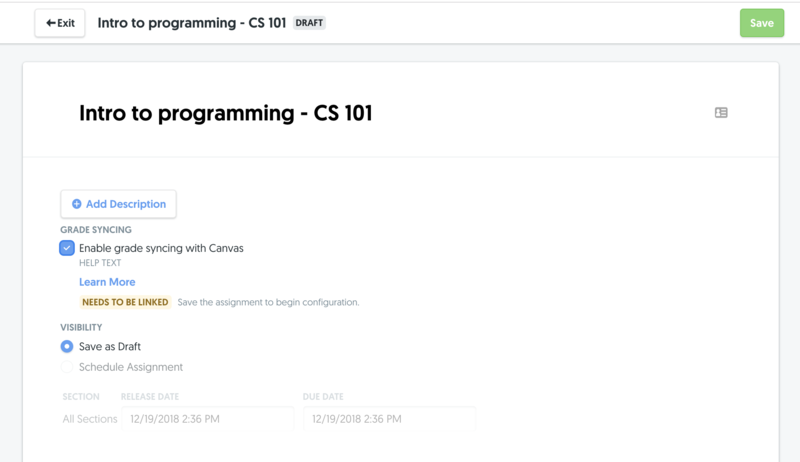 You can still enter their grade manually in Canvas but if you'd like to do this through Mimir Classroom, your students need to open the project/assignment through the link in the corresponding assignment in Canvas.